First, I have to say that I'm not going to lecture about why I think that Cloth Diapering should be the only option. We are well aware that we could fail at this adventure. But I am going to list some of the reason's we chose to go with cloth. Money: This is a huge factor for us. The possibility of saving $1500 in the few two years of Jackson's life is a real motivator. Sensitive Skin: Cloth Diapers tend to be better for sensitive skin and both Chris and I have it. Environment: We could be saving our environment from all those diapers that Jackson would be using. I know Cloth Diapering isn't for everyone. Heck, we don't even know if it's for us yet but we really want to give it a shot. I have a secret, I've been winning cloth diaper blog contests for about a year and have ended up winning 18 One Size BumGenius diapers. That gave us a good start on our stock pile. 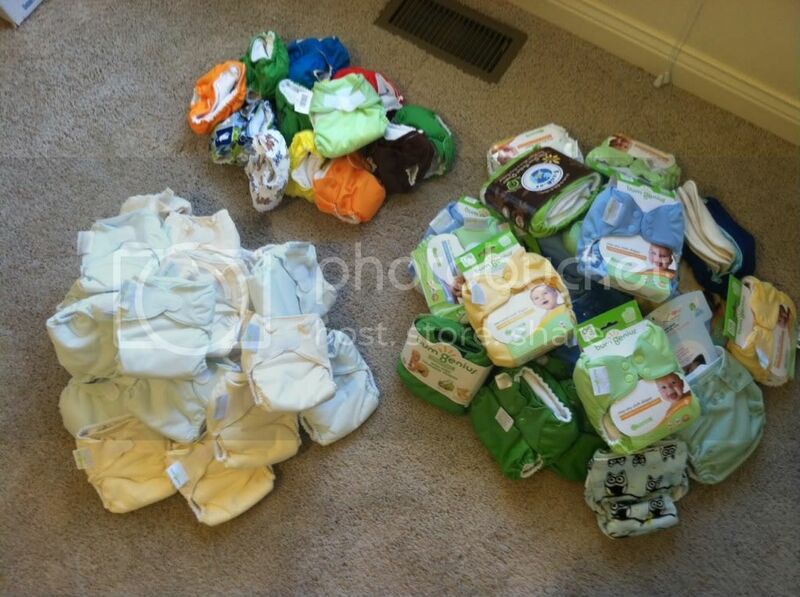 So our count so far we have 16 Lil Joey's, 26 BumGenius Small All in Ones and 26 One Size Pocket Diapers. Since Jackson will be going to daycare, we are trying to stick with the easiest solution for them. So we are maily going to be an All in One/Pocket Family. Why or why didn't you decide to cloth diaper? I just saw your post about your nursery furniture and am envious because I am delaying it until after Christmas. Or at least mainly. However, we too are going with cloth diapers and I wanted to give a shout out. We're going to give g-baby a try. I'm a little anxious because they seem a bit complicated (like a cover, a liner, a cloth insert, AND a poop liner?) but I really like that they have biodegradable inserts to flush for when you're on the go. I know there are some great wet bags out there, but I really don't relish the idea of carrying dirty diapers in my bag. But yeah, the combination of money and environment are biggies. The other thing that many of my friends said prevented them from goign with it (aside from start up cost--which I realize when you have all these other costs and not much money disposables seem like a good alternative) was either not having a washer/dryer or feeling like having enough diapers to constitute a load of laundry/doing laundry with a small load of diapers made it impractical. However, we have an impeller washer that senses the load size, so I'm interested in seeing how we do on that. Oh I've never heard of those. I'll have to look it up. Oh yay, I can't wait to hear how you guys like it too. I'm really excited to start cloth diapering and hoping that we love it as much as I think we will. We have a really good start on diapers.